In a recent post I expressed my hope to run a ‘good’ marathon once again, almost half a century since I last did serious marathon training. In that intervening half century several outstanding individuals have demonstrated that even in old age it is possible to run a marathon in a manner that would be creditable at any age. These elite veterans include Ed Whitlock, John Keston, Derek Turnbull and Yoshihisa Hosaka. 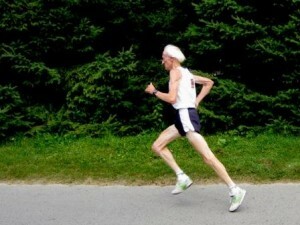 Nonetheless, despite their incredible feats, even these outstanding veteran marathoners have suffered decline with age. It is clear that outstanding performances depend on both intrinsic talent for distance running and remarkable ability to slow the progress of the inevitable age-related decline, in addition to the determination and ability to train well. These veteran marathoners have demolished previous concepts of what training the elderly frame can withstand. While it is almost certain that genetic factors set them apart from the average person, it is worth asking if the way which they have trained has played a substantial role in their ability to slow the progress of decline, and in particular, to allow them to continue train at the level required for elite performance in old age. All four of these elite veterans have trained in different ways, though there are common themes. In this post I will focus on the training of Whitlock, and in my next post on Hosaka, but also draw on some observations of the training of Turnbull and Keston in an attempt to tease out some of the key issues. Whitlock was the first person over 70 years of age to break 3 hours for the marathon with a time of 2:59:09 in the Toronto Waterfront Marathon in September 2003 at age 72. A year later in the Waterfront Marathon he took more than 4 minutes off that time, achieving the phenomenal time of 2:54:48. 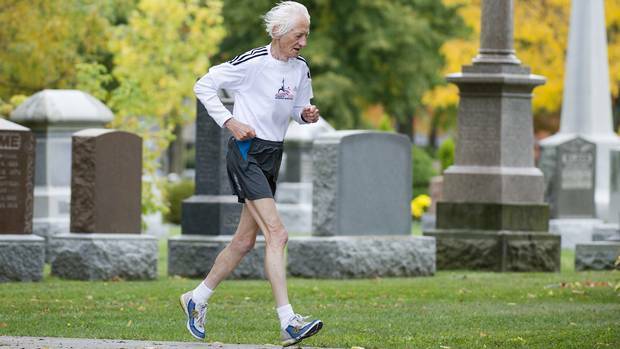 In last year’s Waterfront Marathon, he set a new world record for an 82 year old of 3:41:57. He remains the only person over 70 to have run a marathon in less than 3 hours, ten years after achieving that feat, and therefore stands as a colossus among ancient marathoners. To what extent can these colossal performances be attributed to intrinsic talent for distance running; to inherent ability to withstand the ravages of time; or to training? As a school-boy, Ed ran a mile in 4:31 and on one occasion beat Gordon Pirie in a cross country race. At that stage he was a gifted distance runner but not extraordinary. He gave up running at University due to recurrent Achilles problems but returned to track running in his early forties. In a discussion on the Let’s Run website, to which he is a frequent and gracious contributor, he reports: ‘My best marathon at age 48 was 2:31:23 at Ottawa in May 1979. This was done off a winter of quite high mileage done in preparation for middle distance track in the summer.’ After some speed work on the track during the summer, he won the M45 world masters 1500m championship in 4:09. By that stage, it was clear that he was not only a gifted distance runner, but was also showing evidence of the ability to withstand aging. However, it is noteworthy, that Jack Foster (discussed in my post on July 23rd) who born a year after Whitlock, ran 2:20:28 at age 50 in 1982. The current world best for a 48 year old is 2:18:57 by Ayele Setegne of Israel, in 2011. Thus, Whitlock’s best marathon time was creditable, but not extraordinary for a 48 year old, despite the evidence that he had done both high volume training and high intensity training sufficient to take him to top place on the podium at the World Maters championship for 1500m that year. Thus, one must look for evidence that a combination of training and extraordinary resistance to aging to explain the extraordinary performances in his seventies and eighties. Ed almost certainly inherited some genes for longevity as not only did his uncle reach 107 but also his father lived into his eighties and his mother into her nineties. Laboratory tests done at The High Performance Specialists clinic in North Toronto tests shortly before his 70th birthday do provide some hints concerning the inherited features that have contributed to his extraordinary running. There was nothing remarkable in the various blood tests. The three noteworthy findings were a body fat proportion of 9.5% (about half that expected), a maximum heart rate of 168 (compared with predicted value of 151 based on the best recent estimate of the relationship between age and HRmax) and VO2max of 52.8 ml/min/Kg compared with the average of 35 for a 70 year old. Ed’s high VO2max was extraordinary for a 70 year old, but was not extraordinary for a three hour marathoner. The formula derived by Jack Daniels to estimate race performance based on VO2max predicts a marathon time of 3:01:00 for an athlete with VO2max of 52.8. Ed ran 3:00:33 in London, Ontario a month or so later. Thus, the task of identifying the source of Ed’s extraordinary marathon performance becomes the task of identifying the source of his high VO2max. How much of Ed’s aerobic capacity is attributable to genes? Can Ed’s high VO2 max can be accounted for by his high HRmax? At first sight there appears to be only a weak relationship between the variation between individuals in HRmax and variation in either VO2max or performance. This is because the delivery of oxygen to muscle cells depends not only on heart rate but also stroke volume and the ability of muscles to extract oxygen from blood, which in turn depend on capillary density, aerobic enzyme capacity and ability to recruit muscle fibres. Variation between individuals in these various factors obscures the relationship between HRmax and performance. However, if all of these other variables are optimised by optimal training, a 10% increase in HR reserve (HR max- resting HR) would be expected to produce approximately a 10 % increase in VO2max. Since a 10% increase in HR max would usually produce at least a 10% increase in HR reserve, it is reasonable to assume that the Ed’s increase of HRmax above the average accounts for about 10% of his VO2max . Daniels’ formula indicates that a 10% increase in VO2max would account for an improvement of about 17 minutes for a 3 hour marathoner. The mechanism that regulates decline of HRmax with age is not fully understood though it is at least partly dependent to the number of ion channels that allow the transport of calcium ions across the membranes of cardiac pacemaker cells. Much evidence indicates that HRmax is not related to training. If anything training actually reduces HRmax a little, though cardiac output increases due to the increase in stroke volume produced by increased blood volume. Twin studies indicate that HRmax is largely determined by genetic factors. Thus, it is very plausible that Ed’s high HRmax, likely attributable largely to his genes, contributed to a reduction of around 17 minutes in his marathon time at age 70. Without this benefit, his time in the London, Ontario marathon in 2001 might have been nearer to 3:17:23 than 3:00:23. While 3:17:23 would be outstanding for a 70 year old , it is not phenomenal. Nonetheless to conclude simply that Ed’s phenomenal performances are due to factors such as high HRmax that are more influenced by genes than training, is to miss a crucial point. The evidence has been discernible since the day he beat Gordon Pirie in a school-boy cross country race that he is an intrinsically gifted distance runner, and the evidence that he is aging well was already apparent when he won the M45-49 1500m at the world masters championship in Hanover in 1979. For anyone hoping to learn from his example, the crucial issue is that he has been able to cope with the training required to optimise all those other attributes: cardiac stroke volume, and the factors that determine the ability to extract oxygen from blood, in a manner that has allowed him to exploit his gift of high HRmax to an extraordinary degree. To what extent is the nature of his training responsible for this? Ed became a good, but not exceptional, masters marathoner at age 48 by virtue of his intrinsic gifts and a training program comprising high volume in the winter and speed work in the summer. In his sixties he increased the volume of training with a focus on long slow long runs most days of the week, while reducing the speed work, largely relying on occasional fartlek session and frequent races. For example in a Runners web interview in 2003 in the week after he ran 2:59:10 in the Toroto Waterfront Marathon, his first sub 3 hour marathon at age greater than 70, he stated : ‘My training is now without coaching and consists of daily long runs, typically 2 hours I don’t measure the distance and purposely keep the speed down. I don’t have any streak going but try to run every day, no hard easy day routine. I do the odd semi “speed” work out, but not on the track. I race frequently to give me speed and to make me race tough.’ In fact, from his various posts on the Lets Run thread, it was clear than some of the long runs were actually of 3 hours duration. Was it the introduction of almost daily long slow runs, or was it the inherited predisposition to longevity that contributed most to the transition from a ‘good’ masters marathoner at age 48 to the first (and still the only) man to run a marathon under 3 hours at age greater than 70? I think that the evidence that the long slow runs played a major part came in the Waterfront Marathon the following year (2004) when he achieved the phenomenal time of 2:54:48 at age 73. In the intervening period, he increased the proportion of long runs of 3 hours duration. In an interview with Scott Douglas for Running Times he reported in the six months leading up to the Waterfront Marathon in 2004 he ran 15 races of 5K-15K and built up his long run time to three hours a day. In a response to a question on the Let’s Run thread, he stated that in the 20 weeks prior to the 2004 Waterfront he did 67 three hour runs, including 18 on consecutive days. He trained for 15.9 hours per week. While not conclusive proof, I think that the fact that an increase in the number of 3 hours runs was associated with an improvement of over 4 minutes from age 72 to 73 is strongly suggestive that the frequent very long runs played a key role. There is of course no guarantee that emulating Ed’s training would allow another individual to achieve the same benefits from that training. It is far from certain that the average 70 year old could emulate his training without devastating physical breakdown. However, few individuals have made a serious attempt to emulate Ed’s training. It would be premature to conclude that his training would not work for others before careful examination of how Ed does it. He builds up the duration of runs very gradually. The number of three hour runs increased gradually over a period of 6 years from occasional three hour runs during preparation from his race in Columbic Ohio in 1998 to an average of 3.2 per week prior to the Waterfront Marathon in 2004. Furthermore, when he has to rebuild following injury, he starts with daily runs of less than an hour and increases the daily run duration gradually by 10 minutes per week. He takes great care to minimise wear and tear on his legs. He trains at a slow shuffling pace designed to minimise impact forces. He does virtually all of his training on 500-600 metre loops of the level paths of Milton Evergreen Cemetery, near to his home, so that he can return home immediately if he develops an injury. He sustains his speed via short distance races and occasional fartlek-style speed sessions. 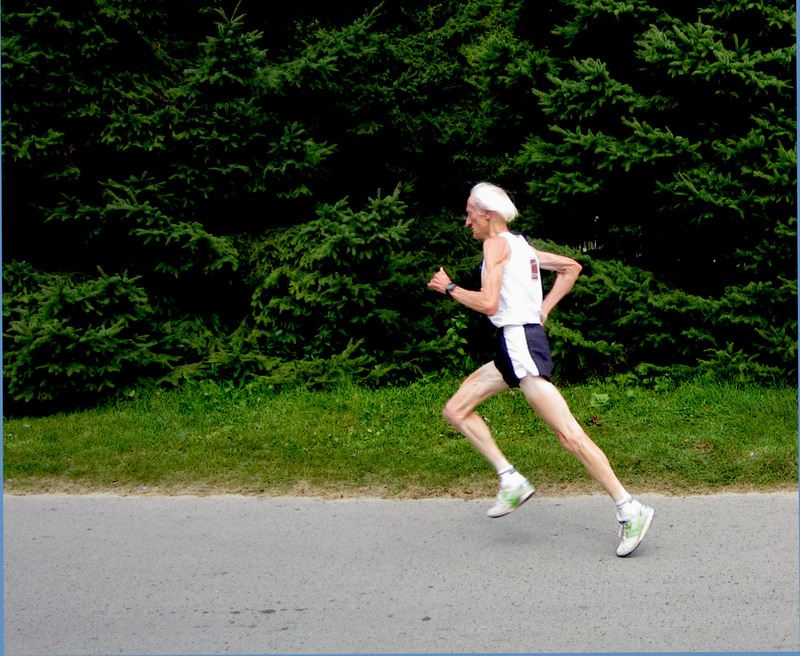 It is noteworthy that during races he does not shuffle, as illustrated by this picture of him during the 2011 Longboat Toronto Island 10Km race at age 80. In light of the evidence that high volume training is associated with harmful accumulation of cortisol and that large increases in training volume are associated with a greater risk of the over-training syndrome than increases in intensity (discussed in detail in my post on 14th April 2009) I consider that the secret to Ed’s success is the gradual build up and his care to avoid wear and tear. He trains with respect for his body. In my previous post on July 23rd I examined the training of Haile Gebrselassie and Jack Foster, both great athletes who succeeded in maintaining world-class performances into middle age. This same theme of respect for the body emerged, though in different ways: in the case of Haile, the carefulness was deliberate; while Jack’s approach was deliberately carefree. To perform maximally over a sustained period, one must train with determination, but merely training hard is not enough. Hard training must be accompanied by sensitivity to the body’s response. In my next post I will examine the training of another great veteran marathoner, Yoshihisa Hosaka, whose training is radically different from that of Ed Whitlock, but in its own way, is also sensitive to the way the body is responding to training.